The key to a successful project is consistency and so our early appointment has already guaranteed that we have shared as much of the journey as possible prior to entering into a ‘build’ contract with you; we know what you need and how to deliver it. Our approach is thus all about management. We manage the whole process from initial consultation to space planning and design, right the way through to moving you in to the new space – and this includes the procurement process. By the time we have reached this stage we will have produced all the documentation required for landlord and local authority approvals as well as designs and specifications that can be issued to contractors to tender. 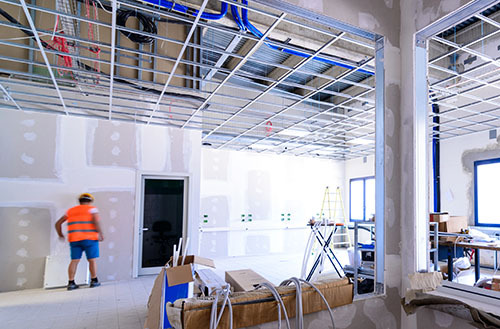 There are a number of ways we can procure the fit-out or refurbishment for our Client’s new offices as, in every case, the timeline and requirement can be quite different. We can act as Principle Contractor, Construction Manager or adopt a Design and Build Contractor position – whichever is preferable and provides the best value for you at the time. In all cases our primary role is to manage the project for you. © Interactive Space 2019. All rights reserved.